Sublette County residents can listen to KPIN 101.1 FM radio for live coverage of the election results Tuesday evening and after the polls close. See the Sublette Examiner and Pinedale Roundup newspapers on Thursday for in-depth election result coverage and interviews with the winners. *NOTE: The Election Results printout show an item called "Ballots Cast-Total". The software is counting each page as a ballot. Since Sublette County has a two-page ballot for this election, "Ballots Cast-Total" shown in the printouts below will be TWICE the number of voters. This will also affect the "Voter Turnout-Total" percentage. This is the ONLY section of the results that this issue will affect. The adoption of this amendment would clarify that all monies deposited in the permanent Wyoming Mineral Trust Fund are inviolate permanent funds of the state. The Wyoming Supreme Court has held that school funding must be equalized among all school districts in the state. The adoption of this amendment would repeal the current limitaion on the amount of property tax revenues that may be redistributed by the state through the school foundation program account from school districts with greater property tax revenues to other school districts in the state. This amendment authorizes the creation of permanent funds for two purposes: First, higher-education scholarships which include the current Hathaway Scholarship program and Second; improving the quality of higher education. The principal in the funds, regardless of the source of the funds, cannot be expended. The earnings must be used for the purposes specified and the Legislature is authorized to regulate how the earnings are used. Earnings from funds in the current Hathaway Student Scholarship account are intended to be used for college scholarshhips. The Amendment would also allow the funds to be invested as the Legislature authorizes including in stocks. Shall Justice E. James Burke be retained in office? Shall Justice Michael Golden be retained in office? Shall Judge Wesley A. Roberts be retained in office? Lee Reeder and Cory Dorman count write-ins for Sublette County ballots Tuesday night. 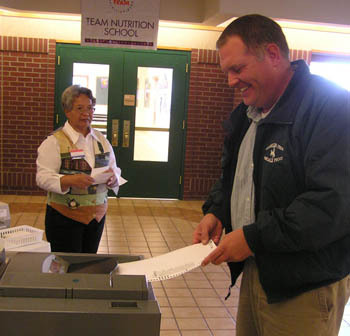 Pinedale Mayor Steve Smith casts his ballot after voting at the Pinedale School Commons Tuesday morning.